Hydrus rynchops Schneider, 1799, 1: 246. 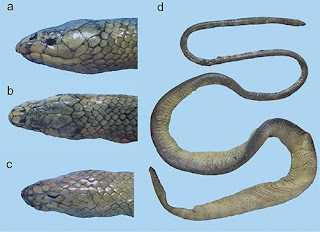 Holotype: Based on illustration in Russell's Indian Serpents, 23, pl. 17, 1796. Type Locality: Ganjam, India. Enhydris rynchops: Sonnini & Latreille, 1801 4: 202. Hydrus cinereus Shaw, 1802, 3: 567. Holotype: Based on Russell's Indian Serpents (1796) illustration 1: 23, pl. 17, and BMNH 1966.1.21.55–57. Type Locality: Ganjam, India. Coluber cerberus Daudin, 1803c, 7: 167. Holotype: Based on the illustration in Russell's Indian Serpents, 1: 23, pl. 17, 1796. Type locality: Ganjam India. Coluber schneiderianus: Daudin, 1803c 7: 170. Python molurus: Merrem, 1820: 89. Python rynchops: Merrem, 1820: 90. Homalopsis cerberus: Fitzinger, 1826: 55. Cerberus cerberus: Cuvier, 1829, 2: 81. Cerberus grantii Cantor, 1836:135, [fide Smith, 1943:393]. Cerberus cinereus: Cantor, 1839: 54. Homalopsis rhynchops: Cantor, 1847: 941. Cerberus rynchops: Günther, 1864: 279. Cerberus rynchops] rynchops: Loveridge, 1948: 388. Distribution: West coast of India to Myanmar and Thailand in vicinity of Phuket Island (Murphy et al., 2012b). The western limits of its distribution were recently discussed by Vyas et al., 2013). Diagnosis: Dorsal scale rows 25 (rarely 23) at mid-body, imbricate plate-like scales on the crown have flat, thin appearance, keeled anterior to angle of jaw; the last two upper labial are horizontally divided; venter mottled.